Today's July the 4th, and around the United States of America plenty of people are celebrating the country's independence. There will certainly be fireworks tonight in more ways than one. What do I mean by this? Why, I have in the schedule the plan to post SuperPhillip Central's longtime coming 600th review tonight! What game will it be!? You'll find out in a few hours. For now, let's get focused on Mega Man, a great run and gun platforming franchise. Actually, let's get focused on the eighth installment, to be exact, Mega Man 8, with my review. It makes sense, as today Mega Man maker Keiji Inafune unleashed a Mega Man Legends-like Kickstarter project for backing. See? These retro reviews usually have a good reason for being posted! ...Usually! Mega Man is one of my favorite franchises ever, and we've seen so many titles featuring Capcom's Blue Bomber in the past several decades. He may be on a bit of hiatus now, not starring in any big games of his own, but Mega still does have a strong following. After Nintendo continued with the cartridge route with its fifth generation console hardware, many third parties moved over to Sony's PlayStation with the promise that CD-ROMs brought. Capcom was one of these third parties, and it brought over Mega Man in the form of the eighth installment of the long-running series, Mega Man 8. See why this modernized Mega Man is worth a play. Mega Man 8's plot begins with two forces of energy, one light and one dark, duking it out in the middle of outer space. The forces collide, causing both to tumble towards the closest planet to them, which just so happens to be Earth. Upon crashing at a secluded island, Mega Man is sent out to find the source of the crash, but unfortunately, Dr. Wily is there to pick up the dark energy. Meanwhile, the being of light is found in an impact crater, who is then taken back to Dr. Light's lab. Eventually working together, Mega Man and the force of light energy, named Duo, must overcome the nefarious Dr. Wily's plan to beef up his robot army with the power of the dark energy and take over the world. Ah, Rush... A Mega Man's best friend! 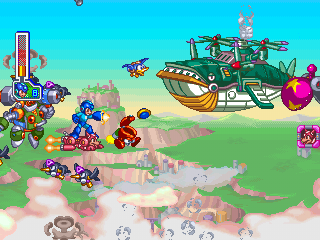 Mega Man 8 uses the PlayStation and Sega Saturn hardware to great effect. There are a series of well animated cutscenes that occur throughout the game, though the voice work that plays during them and throughout gameplay ranges from passable to absolutely awful. (Dr. Elmer J. Light being the worst example.) That said, the story really comes to life with Mega Man 8. While most who play a Mega Man game don't play the games for superfluous story elements, you can skip all cutscenes if you really just want to get into the game. That's the problem with crabs. They'll get you every time. 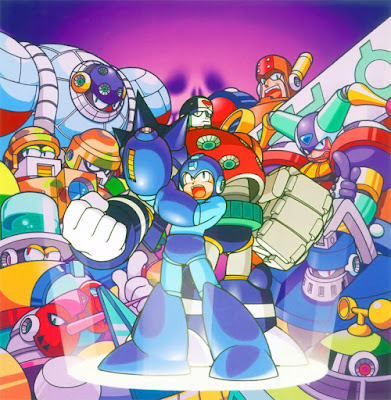 The structure of Mega Man 8 is most like its SNES predecessor, Mega Man 7. 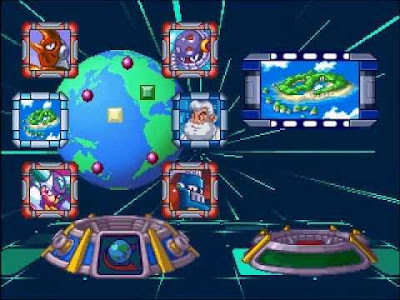 There is an opening stage to play through, and then you get a selection of four Robot Master levels to choose from. 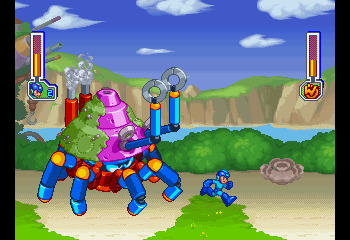 After the initial four boss levels are completed, a midway stage opens up, followed by the latter four Robot Master levels. Mega Man 8 is a globe-trotting trek across the planet. As with any classic Mega Man game, the best course of action in choosing which Robot Master stages to tackle comes from which special weapons you have in your possession. For instance, starting off, you just have your Mega Buster, Mega Man's standard weapon, so it's best to take on a Robot Master that can be defeated easily without any other special weapon. A defeated Robot Master means gaining their special weapon, making it a lot more manageable to beat the Robot Master that is weak against that weapon. Every Robot Master has its own weakness to a special weapon. The Flash Bomb does heavy damage to Frost Man, while the Astro Crush makes short work of Aqua Man. "I'm Aqua Man, but you can call me 'screwed'." Levels in Mega Man 8 also put to good work the beefed up hardware. For instance, Clown Man's stage features a robot with a mallet in the background that intermittently comes out of its door to ring the clock tower bell. 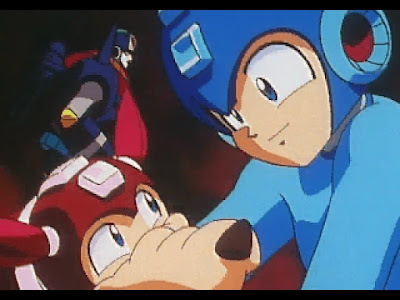 Whatever block Mega Man is standing on when this happens results in some kind of interaction. An "O" means safety, while an "X" causes a punching glove to pop out like a cruel and painful jack-in-the-box. Then there is Frost Man's infamous stage which consists of snowboarding down a perilous pathway with great speed, listening and watching the signals for Mega Man to "jump" and "slide." I mustn't forget Tengu's Man stage, where Mega Man rides Rush through an intense on-rails side-scrolling shoot-em-up section! Would anyone else like to join our aerial strike team? 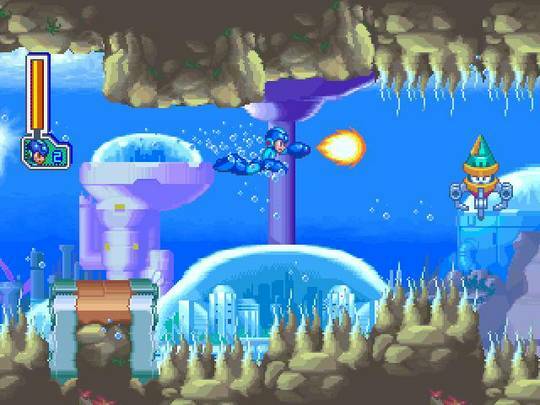 Like Mega Man 7, Mega Man's eighth outing has several reasons to return to levels. Instead of a wide range of collectibles that require painstaking digging random spots in the ground as Rush, Mega Man 8 houses 40 special bolts to find and acquire. This is, of course, totally optional to do, but they're great for two reasons: 1) They beef up the replay value of the game, and 2) They can be used at Dr. Light's laboratory to pay for special chips. 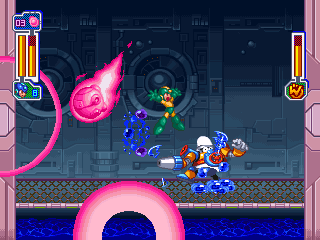 These chips range from an exit chip, allowing exit from a level without having to lose all your lives and returning to the stage select menu, to special upgrades to Mega Man's Mega Buster. Bolts often require taking the road less traveled, as well as returning to levels once a new special weapon has been acquired. Unlike most of Mega Man's past games, Mega Man 8 is noticeably much easier to play and to beat. There is no shortage of 1-ups to come across, enemies don't do much damage to Mega Man compared to past games, and levels have ample amounts of checkpoints so redoing whole sections of levels isn't as much of a punishment this time around. Still, while it's not the challenge for the thumbs that pre-32-bit Mega Man games were, Mega Man 8 is still a blast to play. too late to teach an old robot some new tricks. I've talked about the voice work and excellent cutscenes in Mega Man 8, but allow me to quickly discuss the visuals and sound as a whole. 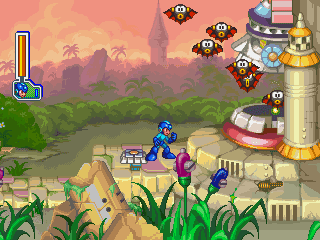 Mega Man 8 features lush, colorful, detailed environments, brimming and bursting with sights for the eyes to behold. Enemies and especially Robot Masters are animated and articulated abundantly well. Meanwhile, the music contains plenty of catchy tunes that while not as memorable as a Mega Man 2 Wily Stage 1 level, offer nice background noise while playing. Areas are abundant and rich with color and detail. 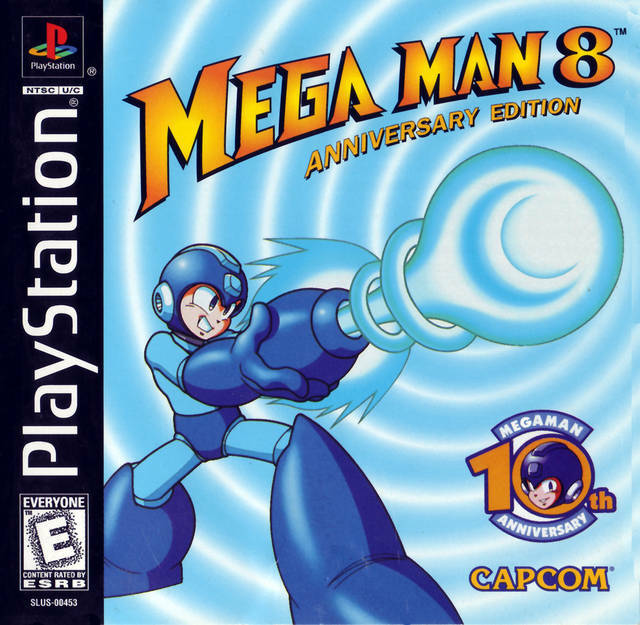 Mega Man 8 isn't the most popular game in the series, but I really enjoy playing it. It makes me feel regret that Capcom didn't continue this more modern style of Mega Man for the two sequels, Mega Man 9 and 10, instead going for the 8-bit style of the series's past. Still, I have hope that we'll see Mega Man back in the spotlight soon enough, and perhaps with a colorful and modern Mega Man game to his name all over again.